How disappointing! The leaves of my fall crop of Golden Globe turnips (Burpee Organic) were nearly picture perfect, but when I pulled some before Thanksgiving, they had underdeveloped roots. When I cut off the stems and the tips of their taproots, I made an unusual discovery: The turnips were hollow. What gives? Bad lot of seeds? Wacky growth because of our extra foot of rain this year? Insect damage? I searched the Internet for information about “hollow turnips” and didn’t find much. Several sites talked about a variety of pests that attack turnip leaves or roots from the outside—but I found no descriptions or photographs of huge cavities caused by disease or pests. 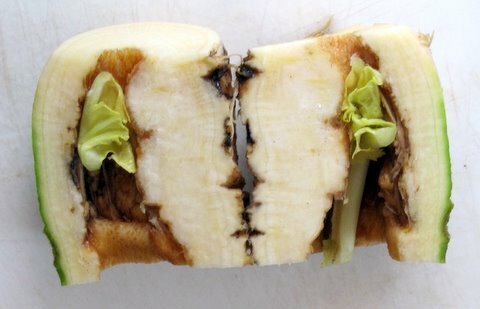 Several sites mentioned that turnips and rutabagas sometimes have hollows because of a boron deficiency of the soil, a problem often linked to repeated turnip crops in the same area, but that wasn’t the case here. It was time for some expert consultation. I fired off email queries to Burpee and to the Maryland University Extension Home & Garden Information Center. HGIC replied first: The hollowed turnips might be caused by a boron deficiency, and I might want to water down next year’s turnip patch with a weak boron solution, but there are other possible environmental factors…. Burpee also replied quickly. Yes, boron deficiency is a possibility, but…. On Tuesday a downpour short-circuited my landscaping project, and I decided to pull more turnips and to look more closely at the problem. I pulled four. 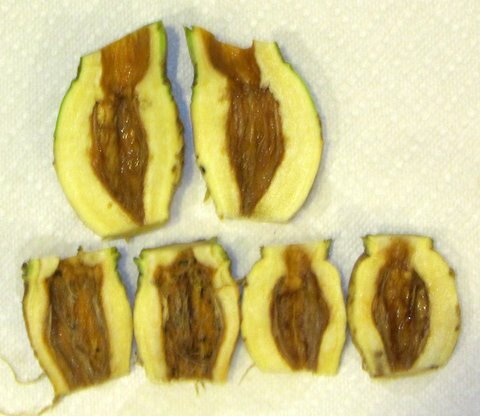 Three were underdeveloped and hollow. The fourth was almost a perfect three-inch globe. I shook most of the soil off the four turnips, cleaned them a bit more by rolling them in puddles on our driveway asphalt, and took them to our kitchen sink, where I cut them open while giving them a final rinse. Hey, what was that washing into the In-Sink-Erator—a piece of mulch—or a small slug? Unfortunately I didn’t react in time to grab and examine whatever it was. After taking photos of the hollow turnips, I again searched for anything online about slugs stunting and hollowing out turnips—and found nothing, even in sites from Great Britain and New Zealand, apparently slug capitals of the world because of their slug-friendly climates. I fired off an update to HGIC with my suspicion that slugs might be the culprits, noting that in the most recent photo, which shows the three hollow turnips with their tops up in the picture, there’s sort of an entry way from the top of the turnip into the root cavity. 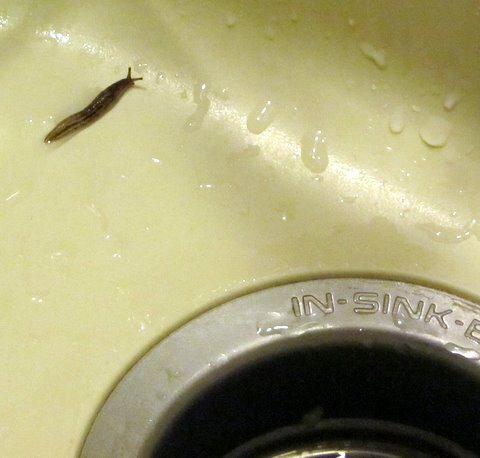 Having second thoughts about a slug in our kitchen sink, I went to the kitchen to clean up a bit more. When I lifted the sink mat—there it was—a living, crawling slug. 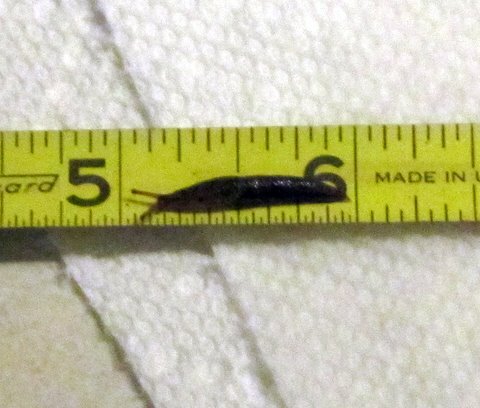 The next morning I found a second inch-long slug crawling up the side of the sink, apparently after overnighting in the In-Sink-Erator. Mystery solved—in my opinion. Newly hatched slugs most likely ate their way from the crowns of the plants into the roots and hollowed them as they dined on the softer flesh. Maryland slugs must be super smart if they can find such nearly perfect places—inside my turnips—to live, eat, and grow. Hindsight says I shouldn’t be surprised. I planted the turnips next to river-stone mulch along the side of our detached garage and just across the sidewalk from a large bed of sedums—both excellent slug habitats. If your turnip crop yields stunted, hollow turnips, consider the possibilities—unusual weather—a soil deficiency—insect predators—but don’t overlook the possibility that slugs have found and adopted your turnip roots as near perfect places to live. And remember to remove all slugs from the kitchen sink before U-Know-Who sees them. If I plant turnips next year, I plan to locate them far from favored slug habitats and, for good measure, occasionally sprinkle iron sulfate slug-bait pellets, such as “Slug Magic,” “Sluggo,” and “Escar-Go!,” in the turnip patch. ← The thinking season; and whither stink bugs?